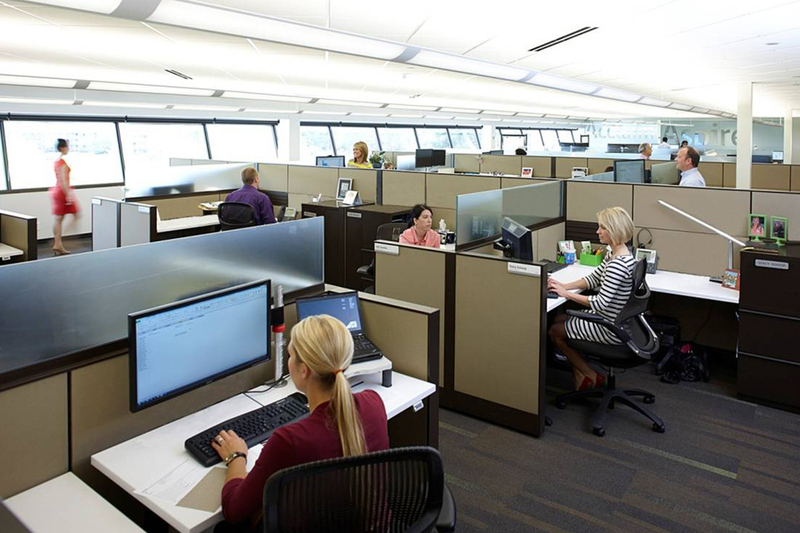 Low horizons connect employees with natural light, which studies show improves alertness and aids cognitive functions. 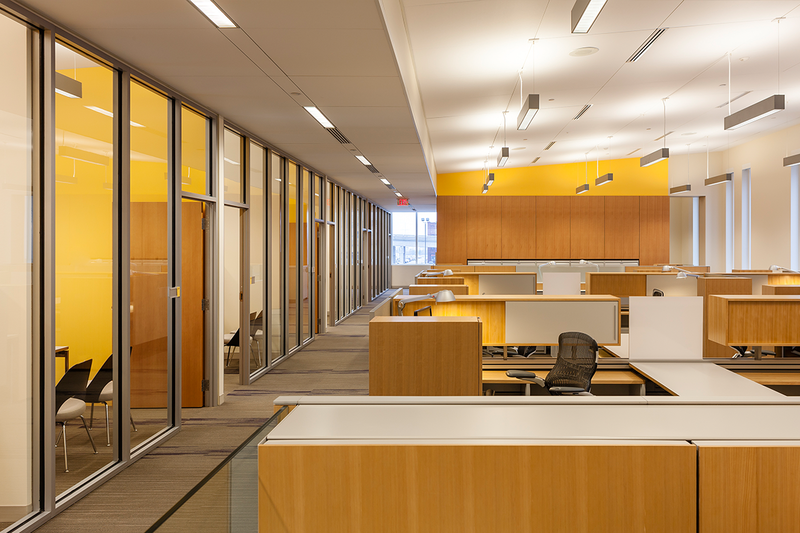 Exposure to natural light may contribute to LEED credits. Shared meeting tables with whiteboards encourage collaboration. Research shows lowering physical barriers between employees can dramatically reduce email volume and increase decision making speed. Bringing panels down creates the “library effect.” Employees become more aware of people around them and naturally work more quietly. The introduction of glass front private offices helps not only bring more light into the space, but also increases the perception of approachability. Social/gaming areas allow employees to decompress, develop stronger relationships and increases the likelihood and effectiveness of collaboration. Flexible seating and agile walls create one space that can be used many ways throughout the day. Patios and other outdoor spaces connect employees with nature, which often renews energy and inspires creativity. In today’s work world, whiteboards have become idea magnets that encourage collaboration. 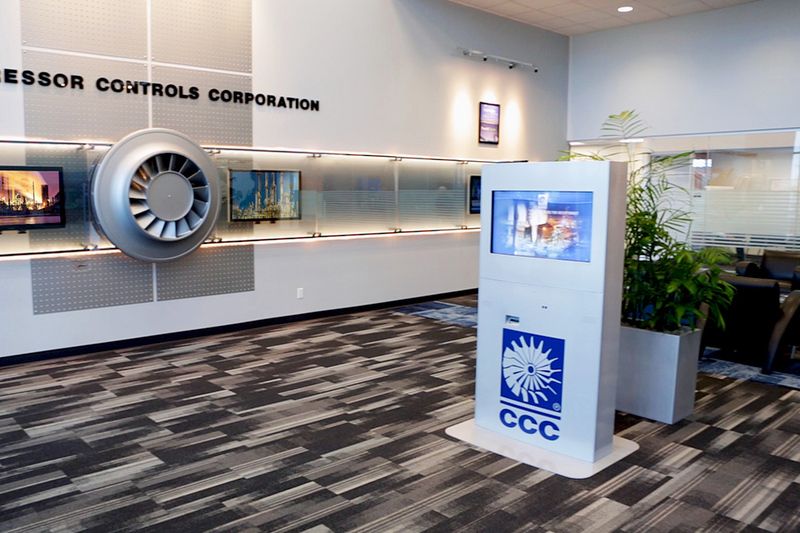 A piece of an actual compressor puts Compressor Control Corporation’s unique, distinctive brand signature on their space. Designing space for specialized technology, like this check-in kiosk, requires special considerations like visibility and traffic flow. Your choice of décor and furniture speaks volumes about how much your organization cares about visitor comfort. Not only does incorporating plants into your space add to aesthetics, but studies show exposure to plants can improve employee mood and general well-being. Moving private offices with glass fronts into the core of the space and having low workstation panels allows all employees to have access to natural light which studies show increases productivity and enhances alertness and cognitive functioning. Desks that can easily adjust from sitting to standing height encourage wellness. Studies show companies save $3 to $6 for every $1 invested in wellness. Perimeter circulation paths give employees the option of taking the longer route to visit colleagues or even doing laps for increased exercise during the workday. Research shows that adults who sit for four+ hours/day have an 80% increased risk of death from cardiovascular disease compared to those who sit less than two hours/day. Overall lower panels encourage collaboration. Studies show simply glancing at someone increases the likelihood that you will interact with them. 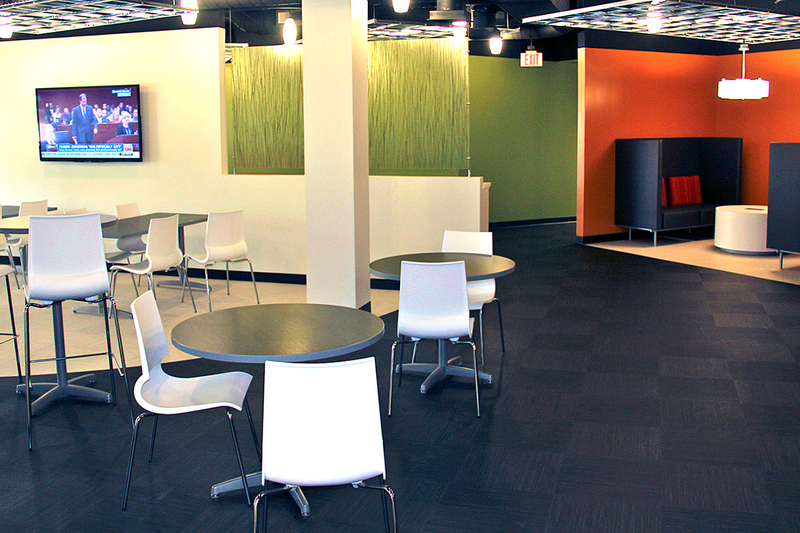 Providing a power cube with multiple electrical outlets surrounded by comfortable chairs encourages employees to interact while gathered around the recharging station. 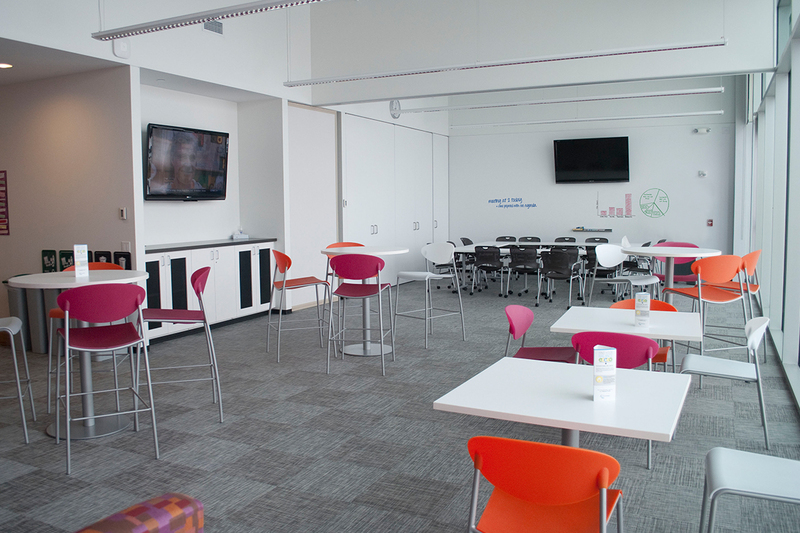 Research shows it’s important that productive collaborative spaces offer the “Five Cs”: Coffee, CNN (TV), Circulation, Connectivity and Comfort. Texture brings sensory change and variability to spaces. Studies show a lack of visual stimulation decreases humans’ ability to stay alert. Studies show bright colors (reds, blues and greens) can have significant positive impacts on moods, focus and creativity. People are the engine that drives a company's success. Investing in the right kind of space can rev up recruitment, retention, engagement, collaboration, productivity, speed to market and innovation. Stay Flexible for Technological ChangeThe accelerating pace of change in technology is changing how, when and where we work. Interior solutions must be agile and ready to host technology that has not yet been developed. Win the War for TalentThere is a growing need to recruit and retain knowledge workers. With four generations in the workforce, there is a dramatic shift in how we intentionally design and furnish interiors to impact employee satisfaction. Encourage InnovationBusiness-critical innovation depends on employee engagement, yet 70% of employees say they are not fully engaged. Creating engaging spaces helps increase innovation and creativity. Accommodate Distributed WorkTechnology has created a mobile workforce that is always on, resulting in opportunities to rethink how to utilize your space. Reallocation of space can result in new strategies for collaboration and distributed work. Communicate Your Social ResponsibilitySocial values matter and they are particularly important to Gen Y. Studies show 86% of young adults would consider leaving their employer if they feel their values don’t align. 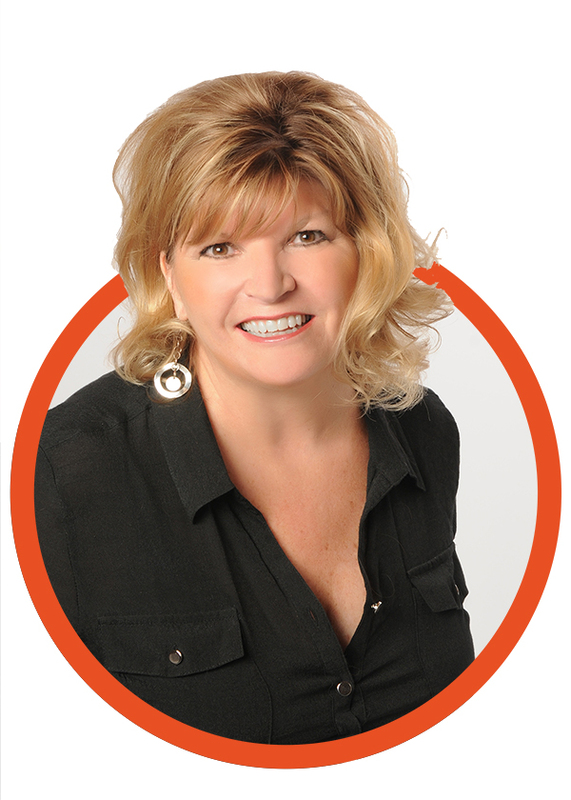 Space is an opportunity to make your values visible to both your employees and clients. Activity spaces are “go to” spaces that include several types accessible to everyone as needed, for focused, shared or team tasks, assembly spaces for larger group meetings or training, and community spaces for socializing or casual work.